Is a Tech Stock Bloodbath Approaching? HomeNewsIs a Tech Stock Bloodbath Approaching? For a hot second, Amazon.com (NASDAQ:AMZN) CEO Jeff Bezos was the richest man in the world. But he didn’t even get a chance to celebrate. After ripping to new all-time highs, Amazon shares reversed and finished the day in the red. The stock dropped almost $7 on Thursday. That’s enough to knock poor Jeff Bezos’ net worth below fellow billionaire Bill Gates. Sadly, Bezos is worth a paltry $89.3 billion as of yesterday afternoon, according to the Bloomberg Billionaires Index. To add insult to injury, Amazon’s second quarter earnings hit the wire after the bell. Judging by the stock’s initial reaction, investors weren’t impressed. “The company appears to once again be squeezing out a very small profit on top of its mammoth retail operations, and that will only face more pressure as it looks to wrap up that deal and gain control of hundreds of retail outlets across the country,” TechCrunch notes, referencing Amazon’s $13.7 billion bid for Whole Foods. To be fair, Amazon wasn’t the only tech stock to hit the skids yesterday. 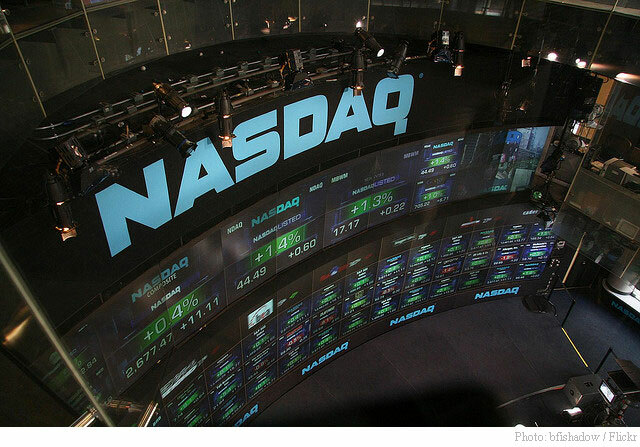 The Nasdaq Composite slipped into the red just after lunch as skittish traders booked profits. All the popular FAANG stocks reversed and moved lower. Even Facebook (NASDAQ:FB) retreated from its all-time highs after beating earnings estimates (although it was the only one out of the group to finish in the green on the day). The FAANGs aren’t the only stocks taking it on the chin as we close out the trading week. Semiconductors – one of the strongest groups on the market – saw significant pullbacks in several popular names on Thursday, including a 3% drop in NVIDIA Corp. (NASDAQ:NVDA). 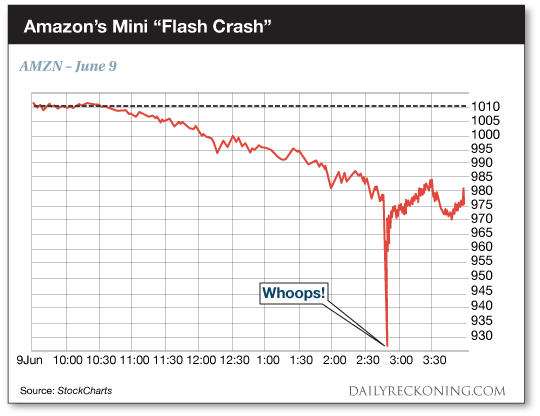 Speaking of crashes, remember Amazon’s “flash crash” last month? Amazon stock dipped below $930 for less than a second during an apparent fat-finger trade back in early June. The stock recovered almost immediately, posting a loss of a little more than 3% by the end of the trading day. That Friday afternoon was a FAANG bloodbath. Facebook, Amazon, Apple, Netflix and Google each fell by more than 3% by the afternoon bell. The tech bulls were finally rattled… but the bears couldn’t prevail. Traders completely forgot about this little hiccup and went right back to buying tech stocks Monday morning. Once we start putting these moves into perspective, it becomes clear that we’re not dealing with the end of the world – or even the end of the bull market. Could stocks fall 5% as we barrel into August trading? Of course. In fact, the market could chop lower the last few weeks of the summer. Despite what we’ve experienced this year, 5% and 10% market corrections are still part of the game. Anyone who tells you stocks can go straight up forever is either a liar or an idiot. The market’s notable lack of volatility during the first half of 2017 has lulled many investors to sleep. The little jolts we’re now experiencing are slapping unprepared traders in the face. They’re another painful reminder that stocks can’t rocket higher every single day without encountering some pullbacks and corrections along the way. Every so often, the market gods must shake out the weak hands. It’s amazing how quickly a confident investor is reduced to tears when a stock that has gone straight up over the past six month takes a big hit. 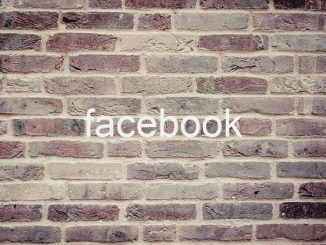 FB Stock: Has Facebook’s Growth Just Hit a Wall?